We will be very happy to welcome visitors to Jerusalem this week – please join us for Davening on Ta'anis Ester and/or Purim. On Thursay (תענית אסתר), Shacharis is at 7:00, Mincho is at 5:05 and Ma'ariv is at 6:11. On Sunday (פורים דפרזים), Shacharis is at 7:00, Mincho is at 5:34 and Ma'ariv (and Megilloh reading) is at 6:25. On Monday (פורים) Shacharis (and Megilloh reading) is at 7:00 and Mincho is 1:30. Mazel Tov to R' and Mrs. Moshe Tzvi Fleischman for bringing their son's wimple to shul. Mazel Tov to R' and Mrs. Boruch Heinemann for bringing their son's wimple to shul. Mazel Tov to R' and Mrs. Michael Friedman for bringing their son's wimple to shul. Mazel Tov to R' and Mrs. Yitzhcok Freund on the birth of their granddaughter. Mazel Tov to R' and Mrs. Meir Erlanger on the birth of their grandson. Mazel Tov to R' and Mrs. Chayim Shmueli on the birth of their great granddaughter. Mazel Tov to R' and Mrs. Yeshayahu Schneller on the birth of their grandson, (son to Shaul Schneller). We regret to inform you that the levayo Rabbi Dr. Jacob G. Wiener z"l will take place 1:30 Wednesday afternoon at Young Israel Shomrai Emunah of Greater Washington, 1132 Arcola Avenue, Silver Spring, MD. Kevuro at 3:30 in Chevra Ahavas Chesed Cemetery, 9800 Liberty Road, Randallstown, MD. His children, Rabbi David Wiener, Mrs. Selma Hellmann and Mrs. Judy Stern, will sit shivo at 1121 University Boulevard West, Apt. 316, Silver Spring, MD 20902. Phone: 301-649-6246. Cell: 845-270-4954. Rabbi Wiener spoke at KAYJ in 2007 when he visited Eretz Yisrael with his grandson, Yehudah Wiener of Monsey. He addressed the N'shei KAYJ with a Shabbos talk Nechama after the Churban: Miracles I didn't expect in Nazi Germany. This emphasized the rebirth of Torah, yeshivos and Minhag Ashkenaz citing midrash, chumash and gemara. A new Seifer Torah was presented to KAYJ, in the memory of our late member, Danny Verdoner Z'L, by his family. The Hachnoso started at Rav Ison (the sofer)'s house, where the last letters were finished, and at approximately 7:30 pm we started walking out with the sefer. Mr. L. Verdoner held the sefer and walked down the steps and out to the chupoh. Just before we got to the chupoh, the speakers started playing the "Seu Sheorim" melody of Namburg, from the recordings of Cantor Hans Blumendal and his choir of Amsterdam. Then the sefer got to the chupoh and we started walking and dancing in front of the תורה, to the accompaniment of traditional local music. Just before we got to the shul, Lewandowski's Uvenucho Yomar, recorded by the Basel choir, was played. Upon entering the shul, the congregation started singing Vayehi Binesoa (Lewandowski), and then the new sefer was put on the Almemar (bimah), and the older seforim circled the new sefer with seven hakofos. At the first hakofo Tehillim 19 was recited in an alternating manner, posuk by posuk (first posuk the Chazzan, next posuk congregation), at the next hakofo Tehillim 29 was sung (with the melody used in hachnoso), then came Tehillim 45 posuk by posuk (as above), followed by Tehillim 67 sung as on Motzoei Shabbos, then Tehillim 84 posuk by posuk, after that Tehillim 100 sung as at English Chuppos (as per recording on our CD), and then finally Tehillim 134 was said (posuk by posuk). After that came Yehalelu and Ledovid Mizmor (Yom Tov melody), and Uvenocho Yomar of Sultzer. Next we Davened Arvis, and continued to Beit Haroeh for the Seudas Mitzvoh. At the seudas mitzvoh Rav Yisroel Gans, Rav Neiman, Rav Hamburger, Rav Weissfish, Moreinu Harav and Rav Dehas spoke. The last speaker was Mr. Eddo Verdoner, who mentioned the wish of his brother Z'L to see the building of KAYJ completed Bimheiro Beyomeinu. Shorshei Minhag Ashkenaz - Minhag Ashkenaz: Sources and Roots, By Rabbi Binyomin Shlomo Hamburger - Synopsis of volumes I-IV. Machon Moreshes Ashkenaz was founded some thirty years ago. Its main purpose has been to research, archive, preserve and disseminate the over one thousand years old magnificent heritage of Ashkenaz. Foremost in this effort has been the publication of the series “Shorshei Minhag Ashkenaz“, which provides a detailed review and analysis of the origins and particulars of the German-Jewish customs and traditions. The series currently is comprised of four (4) volumes. As these volumes currently only available in Hebrew, and in order to make this work more widely accessible, the Machon recently published an English summary of these four volumes . We hope that this book will be of interest and assistance to all those who have an interest in the rich heritage of Ashkenaz. Mazel Tov to R' and Mrs. Avrohom Rothschield on the birth of their daughter, and on the birth of their grandson. Mazel Tov to R' and Mrs. Yosef Prager on the engagement of their son. Mazel Tov to R' and Mrs. Chayim Shmueli on the birth of their grandson. Mazel Tov to R' and Mrs. Michoel Kernberg on the Bar Mitzvoh of their son. We are very happy to announce that IYH on Monday, (אור לי"א חשון, October 18th), the הכנסת ספר תורה Le'ilui Nishmas our late member, Danny Verdoner ZL, will take place in K'hal Adas Yeshurun Shul, in Ramot Jerusalem. The Seifer was donated by Danny's parents and brother, and was written by our esteemed member, Rav Don Ison. 7:00 PM - the Kesivoh of the last letters of the Seifer will take place at the home of Rav Don Ison, Pisgat Ramot 92 flat #8. 7:30 PM - taking the Seifer to K'hal Adas Yeshurun followed by Ma'ariv. 8:30-9:00 PM - Seudas Mitzvoh at "Beit Haroeh" (35 Rubin st., Ramot D). All members and friends of KAYJ are invited to the Seudoh. Please let us know if you intend to participate. Rabbi Binyomin Shlomo Hamburger has put out a series of 3 volumes about The High Yeshivoh of Fürth: A Torah town in South Germany – published by Machon Moresheth Ashkenaz 2010. This monumental series reviews the history of Torah study in Germany as part of community life, since the Middle Ages until the nineteenth century and is a must in every home that respects the traditions of German Jews. By clicking on this link you can see the ad. 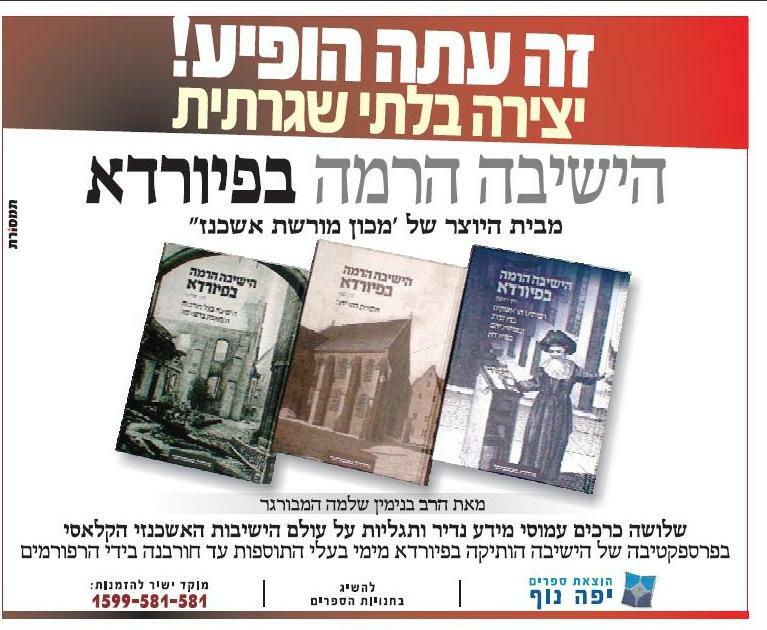 The books can be obtained in many bookstores in Israel, and through Machon Moreshet Ashkenaz. Our Rov, Harav Yehudoh Gans Shlito, made a Chol Kreisch for his newborn son (Yosef) on שמחת תורה saying all the Pesukim as they appear in the Rodelheim Siddur, and he stated at this event, that it is a very old Minhog, which is brought already in the Seifer Chassidim. Mazel Tov to R' and Mrs. Aryeh Kahn on the birth of their Son. Mazel Tov to R' and Mrs. Michoel Kernberg on the engagement of their son Eliezer.